One hour or little more train ride from Tokyo takes travellers to Hakone, a mountainous area between the Ocean and Mount Fuji. This place, although as similar to as many other mountainous areas in Japan, is capable of inspiring people thanks to the relaxing and soothing views and thanks to the huge offer of activities and entertainment. The two main entry points to the area are Hakone-Yumoto station and Hakone-machi station. Below is a list of things to do in Hakone. Among all the onsen (hot bath) experiences in Japan, surely Hakone is the best for those living in the Tokyo area as it is very close to the city and easily reachable. Hakone boasts a high concentration of natural hot springs, all known for the quality and variety of their minerals. The Japanese travel to Hakone, even within the day, specifically for soaking their bodies in one of the natural pools scattered in the mountains. There are many public or hotel-owned baths, but the must-try onsen are the open air baths. Many hotels offer both indoor and outdoor pools, and even private outdoor onsen can be arranged, like in the case of Washintei Hougetsu. We have all read the children's book "Little Prince". Well, in Hakone, a short bus ride away from Lake Ashi, people can be children again in this themed museum. They can also learn a bit more about the author, and a bit about French architecture, since the whole museum and garden around it are made to look like a French town. To reach this spot in Hakone you will have to get on a ropeway, from Gora (at the top of a mountain, going down) or from Ashi Lake to go up. Owakudani is the mid-way ropeway stop. The peculiarity of this valley is...it is smoky! There is intense volcanic activity deep down under the surface here, and there is plenty of sulphur that's released constantly through many vents. The air is full of sulphur, so it smells bad, and the landscape is rather volcanic: bare, smoke coming out of the soil, no other signs of life, although views can be gorgeous, especially from the ropeway. However, one thing drags a lot of visitors: black eggs. These are ordinary eggs, but due to being boiled in the sulfuric hot spring waters, their shells turn black. It is said that eating one of those eggs increases your life span by 7 years! The very first thing to do once you arrived at Hakone-Yumoto station is to get to Lake Ashi, a lake that formed in the caldera of an extinct volcano. The reason is simple: stunning views of Mount Fuji can be enjoyed from this lake. Unfortunately, one must say that Fuji is often hidden behind clouds, making a sighting quite challenging. Winter days are more likely to give a clear view. That said, a trip to this lake deserves some consideration anyway, because all the nature around it is so beautiful. I personally don't play golf but the Japanese love the sport, so whenever there is some nature available for it, there can be a golf course built. In the Hakone area alone there are something like 10 golf clubs, with most of those located very close to the lake, like Hakone-en Golf Ground and golf club. In case you are a lover of this sport you can think of enjoying playing while sightseeing and relaxing in Hakone, with the added value of having great scenery and landscapes around you. The temple was popular among samurai warriors, it sits by the shore of Lake Ashi. 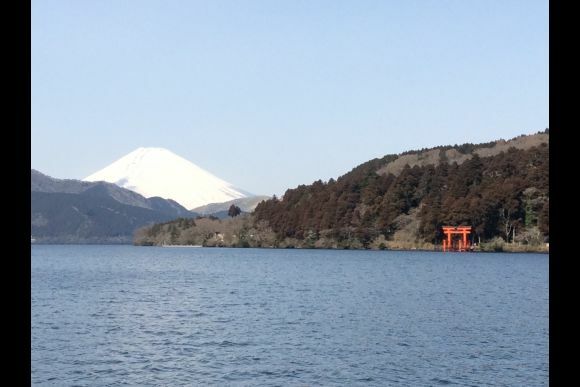 The perhaps most iconic element of this shrine is its red torii (wooden gate) in the water, visible from the south and west side of the lake, while the main buildings are hidden in the forest. Where there are mountains there are also hiking trails. Definitely the valleys and peaks all around offer plenty of chances for all levels of hikers. Hakone is part of the Fuji-Hakone-Izu National Park, and is a well known destination among nature lovers. Several mountain peaks all around the Ashi Lake, offer nice views of the central Japan mountain chains and Fuji. Highly recommended is to go hiking in this area during the autumn seasons, when trees leaves turn red. This is definitely a one-of-a-kind experience. To go up to the Gora Terminal from Hakone-yumoto, you can take a ride on this special train. It is only two cars long, but it zig-zags up and down the mountain, proving to be an interesting, old-fashioned, slow ride. Along the route, the train switches directions to trick the steep elevation, with the train drivers, one at each end of the train, switching at the commands. In summer, hydrangeas along the route bloom, making it the preferred time of the year for such a trip. A way to take the entire view in–the lake, the mountain and everything else–is to hop on the ropeway and enjoy the slow mid-air ride. The ropeway connects the Lake Ashi with Gora Station, passing by Owakudani. The caldera, the sulphur vents and the mountain chains in the distance are also well visible from up there. Very often the whole region in Hakone is swallowed by the fog, which makes a ride on the ropeway a rather scary experience, as it looks like the small cabins come from nowhere and go nowhere. Definitely a peculiar museum that deserves a visit in as it was the first of this kind to be opened. The artworks are all from modern and contemporary artists and are displayed in the open. There are close to 100 sculptures scattered around the huge lawn/park that the museum is. Also, a dedicated structure hosts a big collection of Picasso works. The museum, although the majority of its collection is outdoors, is open year-round, in order for visitors to be able to experience art in different contexts, so to speak. There are also permanent and semi-permanent exhibitions in the museum galleries. This place is also good to take kids to, as they can experience art while having fun (some of the sculptures are OK for playing with). Perhaps one of the most interesting museums for those seeking a fulfilling experience: art, architecture, nature and entertainment all come together. The museum is built in a way to be almost all underground, in order not to spoil the beauty of nature around. Its modern building is an example of excellent design merged into the surroundings. Since 2013 a nature trail is available, where visitors can walk completely immersed in nature, watching wild animals and plants in the quiet of Hakone mountains. Not too far from the Gora ropeway stop is Gora Park. This really is a French style park, with rose and herb gardens. There are also a craft houses there, where visitors can learn, among other things, how to make glass. One of the selling points of this spot is views and scenery, as it sits on higher grounds. The Tokaido Road is one of the most important arteries in Japan, connecting Tokyo to Kyoto. In the present day, not much of the original paved trail is left, as the majority of it was turned to highway because of industrialization. However, there are still some stretches of it that are kept in their original state, thanks to the fact that they deviate from the planned modern routes. Thankfully, along the Tokaido Road, many towns would serve as posts, so that travellers could stop by, rest, eat and then continue. Hakone was one of those post towns, and managed to escape the modernization of the road so that a part of the old trail can be walked along for the joy of nostalgia. The trail is partly stone paved, partly bare, and winds through the forest. An absolute must do. This boat ride is apparently very popular among the Japanese. It is possible to cross the lake via some ferry boat services, especially because people want to try their luck in taking pictures of Mt. Fuji in full view. Several of those boats are actually warships, with sails and cannons, commanders and pirates, and all. Those boats take you on a tour around the lake or simply ferry you from one end to the other. Also, travellers can visit the various locales in the ship, to learn more about them. The Japanese people like tours. Since the Hakone area is not easy to navigate, unless one has a car, various means of transportation, all mentioned in this post, were devised to create a kind of circle of transport. There is even a pass ticket that can be purchased either in Tokyo's Shinjuku station (from where the Odakyu company has direct trains/buses to Hakone) or in Odawara, which represents the entrance door to the Hakone park region. Using this pass people can hop on and off the various transports and cover the most iconic spots of Hakone. So, a typical tour starts from Odawara or Hakone-yumoto, with first base in Hakone-machi. Next is the boat cruise on Lake Ashi, which brings tour enthusiasts to Togendai Station (and pier), on the north shore. From there is the ropeway to Sounzan, with or without a stop in Owakudani for a black egg of longevity. From Sounzan there is a small cable car train, so basically a car on rails and cable, that covers the short but steep distance up until Gora Station. Finally, the Tozan Train zig-zags down from Gora to Hakone-yumoto (or even to Odawara). My two cents on this tour: if you would like to try it, clockwise or anti-clockwise, then plan an extra day for it. All these transportations are slow and crowded, being very popular as it is, so times can stretch considerably. All together, the tour can take up the entire day, considering also that opening and closing times are somewhere around 10am and 5pm. Day Trip to Hakone in a Romantic Hot Spring Inn, from Tokyo!